The railroad not only transformed America’s economic landscape, but it also profoundly changed its citizens. But while there have been many histories of railroads, few have examined the subject as a social and cultural phenomenon. 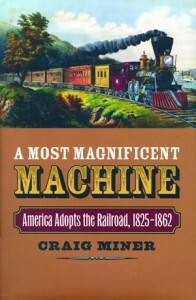 Miner, who was a professor at Wichita State University, traces the growth of railroads from their origins in the 1820s to the onset of the Civil War. He died a month before the book’s publication. ISBN-13: 978-0700617555. Published by University Press of Kansas, 2010.